Tim Burke was diagnosed with multiple sclerosis in 1998, but that hasn’t limited his determination to compete in races and endurance competitions throughout the northeast. In fact, the diagnosis sparked a competitive fire in Burke. Having served as the Dalton postmaster for the past six-and-a-half years, Burke decided he wasn’t going to let the disease dictate his future. 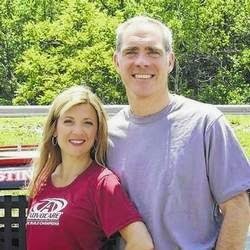 Burke and his wife, Susan, will host the inaugural MS Myelinator 5, a five-mile race or two-mile fun walk, starting at noon on Memorial Day, May 25 at the Dalton Fire House and continuing on the Countryside Conservancy Trolley Trail out and back. The Dalton resident felt the Trolley Trail would be the ideal place for the race. Burke completed the Steamtown Marathon in both 2011 and 2013 and cherished the experience of meeting new people. Finishing the race in 2011 led the Burkes to a new venture - coaching at the Scranton Running Company. According to Burke, the program is for beginner or intermediate runners looking to get in shape and eventually run in races. The transition to long distance running while dealing with a disability presented obstacles for Burke. He credits his wife for helping him fight through difficult situations and continue working toward his goals. Burke is currently on the National MS Society’s Team for the 2015 Panasonic NYC Triathlon July 19 and funds raised through the Myelinator 5 will support that cause. Runners can sign up by visiting runsignup.com/msrace, clicking the line of the race’s Facebook page htps://www.facebook.com/msmyelinator5?fref=ts or stopping in the Scranton Running Center. Reach Robert Tomkavage at 570-704-3941 or on Twitter @rtomkavage.